There are a plethora of piano courses taking place every year here in the UK. The majority are held during the Summer months, coinciding with holiday periods, usually offering a mixture of one to one lessons and group classes. Courses can be a very helpful addition to a pianist’s regular musical activities, providing much-needed extra ‘ears’ and piano tips. 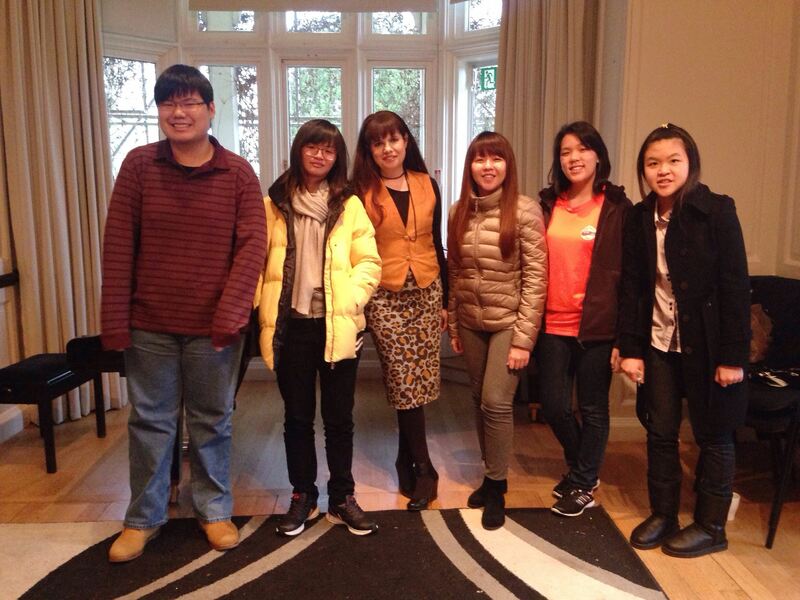 Two years ago, I was invited to coach group classes on the Overseas Malaysian Winter Piano Academy (as it was then known), which is held at the Yehudi Menuhin School in Surrey, UK. The structure of this course is fairly unique, in that it provides high quality lessons, classes, concert opportunities and a UK ‘experience’ to a group of talented young musicians from the Far East. Most of the participants are from Malaysia, although this year there were some students from Singapore too (25 pupils in all). Each participant has been auditioned and selected, and most are at least Grade 8 standard (many were far beyond this, several students in my classes had already achieved the FTCL or FRSM). Once chosen, pupils fly to London for twelve days, returning home on Christmas Eve, after a fantastic musical adventure. This course was established in 2010 by Malaysian pianist Bobby Chen, who masterfully arranges all the activities and events. Bobby is a busy concert pianist who studied at the world-renowned Yehudi Menuhin School, and it does indeed provide a marvellous backdrop. The facilities are superb, with plenty of large music rooms all resplendent with one or two excellent pianos, as well as two concert halls, and beautiful surrounding grounds. Each pupil receives several individual piano lessons, many groups classes (in Composition, Improvisation, Conducting, Chamber Music etc. ), lectures, evening recitals given by some of the tutors, the opportunity to hear their fellow student’s lessons (most lessons are open classes), the chance to play in the final Gala concert, and a visit to London, taking in cultural sites and concert performances too. Most participants are pianists, but there were a few string players for the first time this year. The faculty is impressive, showcasing some of the finest musicians and teachers: Anthony Hewitt, Dominic Alldis, Mikhail Kazakevich, Thomas Carroll, Julian Jacobson, Carole Cerasi, Andrew Ball, Douglas Finch, Leslie Howard, Murray McLachlan, Ruth Nye, Terrence Lewis, Stephen Goss, Graham Caskie, Boris Kucharsky, Mihai Ritivoiu, Tomasz Ziemski, Aleksander Szram, and me. I gave three hours of classes to four groups. One hour each on Technique, Sight-reading and Memorisation Techniques. I enjoy group lessons and so, it seems, do students, as they eagerly learn from each other; lots of interaction can be both fun and instructive. My classes contain plenty of participation at and around the piano, and there’s always a Question and Answer session and discussion time too. One great advantage of staying on campus for a couple of nights, is the chance to meet some of the faculty and enjoy their lectures and recitals. I was fortunate to have free evenings, and was able to hear three lectures. Pianist and Professor of piano at the Royal College of Music, Julian Jacobson, presented a fascinating talk about the first movement of Beethoven’s Appassionata Sonata No. 23 in F minor Op. 57. Julian played all 32 Sonatas in one day for charity last year, at St. Martin-in-the-Fields in London, so he has a wealth of knowledge on this subject. He played excerpts from the piece and shed much new light. There were two lectures on the second evening. Pianist, Head of Keyboard at Chetham’s School of Music and Professor of piano at the Royal Northern College of Music, Murray McLachlan, talked about his new publication, The Foundations of Technique, published by Faber Music. Murray explained the reasons behind writing the book (formed from articles he had written for the International Piano Magazine, over many years), and the importance of honing piano technique. Covering wide-ranging crucial topics, Murray demonstrated at the piano and spoke eloquently. The second lecture was given by Pianist and Professor of piano at the Royal College of Music, Andrew Ball. Andrew lectured, demonstrated at the piano and also played recorded excerpts about his love of Twentieth Century music. It was an interesting journey of personal discovery and reflection. On my third and final evening at the school, we all enjoyed a piano recital given by Murray McLachlan. The programme consisted of Chopin’s Berceuse in D flat major Op. 57, Liszt’s Sonata in B minor, and John McLeod’s Fifth Piano Sonata, which was written especially for Murray. The recital was certainly a highlight and I will write in more detail about it and the wonderful McLeod Sonata in a future post. Students were clearly lapping up the musical riches on offer at the course; many claiming they had never experienced such a rich tapestry of stimulating events and performances. I was only sorry I couldn’t hear my colleague’s open classes during the daytime. Bobby must be congratulated for his meticulous attention to detail, and ingenuity in creating a course which juxtaposes his homeland and heritage with that of his education and present life. He has changed the lives of many Malaysian piano students, opening up a whole new world of possibilities. I look forward to the Overseas Masters Winter Piano Course 2016. With one of my classes (photo: Jiacy Chuah).